The Ultimate Cheat Sheet On Skin Care In Your 20’s! Did you know that taking a proper care of your skin in your 20’s will result in having a much younger, brighter appearance in the future? Doesn’t matter if you’re in your early or late twenties, it’s never too late for that! It’s never too early to start using antiaging! I know, I know. You think that antiaging starts around 30’s and using it now will make your skin get used to the ingredients and they will stop working in the future! I’ve heard that SO MANY TIMES! And you know what is funny about it? There is no, zero, nil (!!!!) medical proven facts to back up this hypothesis! I mean, I’m not saying that right now you should sneak out to your nan’s house and steal her cream lol but let’s be honest – prevention is the key! Start with light ingredients, see what you can do! For starters, try reading my post about 10 steps Korean skincare explained! Korean skincare, in general, will help you understand your skin’s needs so much better, it will also help you to choose right products for it (leave me a comment for more posts about it ^^v )! I think I will be mentioning this one forever! Sunscreens are not only for holiday use! You should wear them every day – yes, you heard me, EVERY DAY! Sunblocks will prevent sun damage to your cells causing your skin to age prematurely, you don’t want to have wrinkles caused by that, right? Not to mention melanomas, other types of dark spots or even a skin cancer! Put on your SPF now! Hands and neck are also important! Okay, so you started using your creams, serums, all the beauty treatments for your face but you’re forgetting about your neck and hands, right? It’s a quite common mistake, sometimes I do that too! At night time I would use my essence to pat it on my neck gently but I usually forget (I’m guilty of that! I know! x.x ) a hand cream! You can have the smoothest face in the world but if the rest of your body is dry and wrinkly then it’s not gonna look pretty – trust me on that! It also makes you look older than you are! I will never understand that, why people can spend a lot of money on face products but completely leave out eye skin care? The skin around your eyes is just super delicate, super thin and SUPER PRONE TO WRINKLES! You’ve heard that word before I’m sure 😉 Antioxidants can be found not only in cosmetics but also in the food you consume! A diet full of antioxidants will definitely pay off in the future! Especially if you’ve hit your puberty a good few years ago and still suffering from acne! I used to have that problem and in my case, it was a hormonal issue. Staying active doesn’t mean you need to join the gym (I’m not discouraging you though lol). Just don’t sit down all the time. Staying active is so important! Thanks to moving, especially on the fresh air, your blood will deliver oxygen to every skin cell in your body! Say “no” to hot showers/baths! I know that after a long day there’s nothing better than a long hot bath (or a shower) to make you feel relaxed. However, in the long run, this pleasure is gonna cost your skin a lot! You know when your fingers get all wrinkly and white when you sit too long in the bath? It means that the actual moisture is evaporating from your body leaving it dry and dehydrated! The Practical Guide To Find The Best Cleanser For Acne-prone Skin! In my experience, cleansing your face with the right products is EXTREMELY important! Why? During the day your skin produces sebum. You might be outside where all the toxins and polluted air are going to cling to your face. You might be using skincare (which I hope you do 😀 ! ), spfs or makeup and imagine that mixed with your natural oils, pollutions and bacterias! Sounds like a perfect environment for SPOTS! So, to make your skin clean – you have to clean it first! 1. What do you need to know about choosing your cleanser? Very often in Western world all the anti-acne products are super DRYING! They’re loaded with alcohol and other ingredients that may be harmful for your skin and cause potential irritation! Have you ever heard that if the product makes your skin tingly/itchy it means that it actually works? Omg, that’s such a LIE! And if your skin goes all red after using it? Stop immediately. Remember about the balance! Stripping your skin off oil (natural ones) is going to cause your face (and the rest of the body) to produce EVEN MORE OIL! Why? Because it needs to balance the loss out! The good cleanser will leave your skin feeling comfortable and soft. If your cleanser make your face feel dry, tight or itchy – again, stop using it. 2. 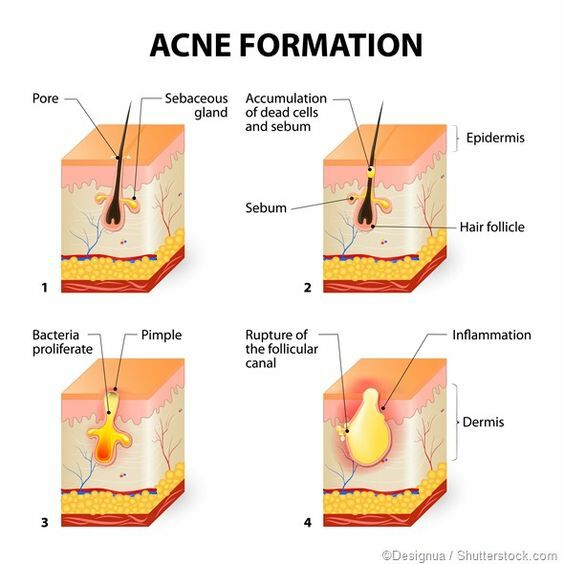 What can cause acne? 3. What are the ingredients to look for and what do they do? what: alicylic acid, some formulations of citric acid. why: They’re water solluble and are good for oily/acne skin. how: They penetrate to deeper layers of skin, clear excess sebum, unclog your pores, reduce blemishes, blackheads, whiteheads and even rosacea. why: They’re water solluble and great for dry skin. how: Because they work in the top layer of the skin, it removes the bond between dead skin cells, helping the skin to exfoliate. why: It’s a strong humectant that absorbs water (about 1000 times it’s weight!) and plumps the skin. how: it aids in the repair and regeneration of skin affected by dryness, environmental stress or irritation. why: It’s a very strong humectant. how: Ingredients like glycerin can help maintain hydration and prevent skin irritation during the cleansing process. how: it’s non-greasy and has got revitalising properties. how: it contains anti-inflammatory and anti-septic properties, reduces the swelling and redness. The high sugar concentration and its acidic properties stop the replication of the bacteria. 4. What ingredients you should avoid and why? why: as a sealant, petroleum jelly can prevent the skin from releasing toxins, sweat, and sebum. If this happens, the skin can’t breathe or eliminate toxins, thereby blocking pores and causing breakouts. why: Lanolin is a natural ingredient produced by a sheep skin to keep their wool soft, just like we produce sebum to keep our skin soft. Lanolin is used in cosmetics and skin care products to provide softness and moisturization, but unfortunately, it is highly comedogenic! 10 steps Korean skincare explained! You have most probably heard about the magical Korean 10 steps skincare routine, right? You’ve seen it on the internet, in some magazines, adverts, in your local shop for sure. So what EXACTLY these 10 steps are? Do Korean ladies REALLY use 10 items everyday in their skincare routine? How long does it take them? In my skincare routine for example I’ve got around 15 products! WOAH, sounds like a lot, I know! it doesn’t mean I use everything every single day! Some products I use only for the morning time, some of them at night time, some of them only ONCE A WEEK! but if you add everything you use in a week – it’s gonna be like 10 lol. 1. I start with a micellar water, I don’t wash my face in the morning (if you find it gross or something then I’m sorry… not), it just doesn’t work for me at all! 2. toner – to refresh and hydrate my skin, I’m using a mild toner for oily skin. 3. essence – essence is going to boost up all the good ingredients in the next steps! for the morning I prefer using a very light-weight, maybe even watery essence for oily skin. it keeps my skin hydrated, but not oily! 4. (gel) cream/(gel) moisturiser/emulsion – like I said, I’m more oily than anything else really! this is another thing in my routine that will make my skin stay hydrated! it’s extremely important! 5. spf – I know, I know… you think that it’s actually needless or like, come on, you want a tan, maybe you think that since you don’t live in an extremely hot climate (or you’re not somewhere on the beach) you don’t need it or maybe your moisturiser has got some so why bother? YOU WERE SOOOOO WRONG! UV rays are extremely DANGEROUS! they don’t only cause the burn, they make your skin age faster, dehydrate your skin and also cause the damage in your DNA (I’m not joking, you can check it anywhere!). not to mention they’re really bad for acne and also make your skin produce more oil. I don’t need to add anything about the skin cancer I guess? For me, the spf must be 50 or 50+! I don’t leave home without it, I don’t want to have millions of wrinkles in a couple of years, you know~ but to be clear, the MINIMUM should be spf30+ ! 2. gel/foam cleanser – removes all the leftovers of the oil cleanser, any other impurities and excess oil. 3. toner – this time I’m using something a bit stronger, preferrably with some acids (I’ve got one with AHA now, but for oily skin it’s a bummer to be honest…). Again, it’s to rebalance the ph levels of your skin, refresh and hydrate it. 4. eye cream – my under eyes are quite dark and also I started developing some crow feet around my eyes too (damn smiling lol). the skin around your eyes is the thinniest and the most delicate! you need to make sure you keep these areas hydrated! Be gentle! 5. essence – in the evening I prefer using more hydrating and nourishing essence. the night is the time when our skin rests and regenerates. atm, I’m using a very light moisturising essence with collagen. 6. serum – we use certain serums for certain skin problems, there are thousends of them available on the market! for now I’m using pore minimising one (but this one is a bummer too in my case lololol) but you could use hydrating, nourishing, anti-aging, anti-acne, brightening etc.! 7. (gel) cream/emulsion for night – I’ve got a really nice anti-aging gel cream for the night time! it’s not sticky, doesn’t feel heavy and doesn’t leave my skin oily either! stick to the consistency that is the best for your skin type! UFFF, that was a lot! but it’s not over yet :DD ! 3. exfoliator – there are different types of peeling, you’ve got physical ones (scrubs) and chemical ones (which I think are my fav ones!). it all depends on your skin needs! peeling is a MUST! it removes all the dead skin cells, I’d recommend using it once a week. Okay, I think I’ve covered all the basics here 😀 I didn’t put the names of the products I use on purpose ;D ’cause will need that for the future posts ahahah ^^ you can obviously change your routine and add or remove some of the products I’ve mentioned, however to me, they’re my essentials and I’m being serious!